The Thieves Guild and Dark Brotherhood Celebration Event took place from March 1 to March 12, 2018. During this event, increased rewards could be earned from Thieves Guild and Dark Brotherhood DLC content. Specifically, double drops were available from group bosses, delve bosses, and regular nodes in the Hew's Bane and Gold Coast zones. Defiled Whiskers drops from Maw of Lorkhaj bosses were also doubled. Rewards for completing daily Heists and Sacraments were increased for the duration of the event. [verification needed — how?] The two DLCs were available at a discounted price, and both Collector's Bundles temporarily returned to the Crown Store at a discount. Held from March 29 to April 2, 2018 on all platforms, the Jester's Festival added Jesters dressed as Jorunn the Skald King, High King Emeric, and Queen Ayrenn near the cities of Vulkhel Guard, Ebonheart, and Daggerfall. Speaking to any of the three Jesters started the intro quest The Jester's Festival, which rewarded the player with the Pie of Misrule Memento. After completing The Jester's Festival quest, the player was able to complete various daily quests for the duration of the Event for Jester's Festival Boxes, which could yield rewards such as the Crown of Misrule Hat, many new consumables, the Cherry Blossom Branch Memento, as well as several new items introduced in 2018: the Jester's Scintillator memento and several housing items. [verification needed — which furnishing items?] Players were also able to gain two new titles, Lord/Lady of Misrule and Royal Jester. Activating the Pie of Misrule memento granted a 100% XP boost for two hours, which could be refreshed an unlimited number of times during the event. Festival daily quests could be obtained again at 2:00 am EDT. The Midyear Mayhem encore event begins on Thursday, January 10 and will run until Monday, January 21. Throughout this event you’ll win bonus rewards by participating in the Alliance War, Battlegrounds, and the fight to control the Imperial City. Throughout Midyear Mayhem you can also earn Event Tickets and purchase the first of the Indrik Berries required to evolve your Nascent Indrik mount into a Dawnwood Indrik mount. This event’s berries are called Dawnwood Berries of Bloom. 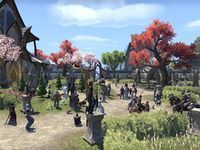 The Anniversary Jubilee is coming back, bigger and better than ever, in celebration of ESO's upcoming fifth anniversary (Holy Aedra, has it been that long already?) and you can test it on the PTS starting now! Chef Donolon will return, ready to bake a brand-new cake for you. This cake is extra-special, however - not only does it grant the usual +100% EXP bonus, it is sweetroll-flavored and will grant you 2 Event Tickets the first time you eat from it each day while the fifth anniversary event is active! To celebrate this incredible milestone, this year's Anniversary Jubilee will last five weeks. Each week will celebrate a different facet of the game and a different member of the Five Companions, the group of heroes who joined up with you to stop Molag Bal's machinations. During each week of the event, a different Companion's unique equipment will be available as Outfit Styles, both from the Anniversary Jubilee Gift Boxes obtained during that week, and on sale from the Impresario. In addition to the highlighted Companion's Outfit Styles for that week, Anniversary Jubilee Gift Boxes' contents have been adjusted. The Jubilee Gift boxes this year can provide one of over 40 Crafting Motifs (or their Style Items). You can expand the window below for the full list. Anniversary Jubilee Gift Boxes also now contain a chance at Jewelry Crafting materials, both raw and refined - including a very small chance at Chromium Plating. This page was last modified on 5 March 2019, at 16:51.